I am partial to this particular make and model of shoe, but since we do not provide free advertising here at The Steampunk Workshop, let's just call them "Cayce Pollards"
But I have a problem, I always wear out the heel long before the rest of the shoe. It occurred to me that a leather shoe would hold up much better to this kind of wear, but I like the ventilation of the Cayce Pollards'. I collect leather bags, purses, and cases at the dump as a supply for nicely patinated leather so I went looking and found a folio case with nice thin, supple leather pieces large enough for my purposes. I made a paper templet and transferred the pattern to the leather and cut it out with scissors. I used a belt sander to thin the leather toward the edges so there wouldn't be any uncomfortable seems. You could probably also shave it with a razor or X-Acto knife. I applied LIBERAL amounts of contact cement to both the shoe and the leather, I was not particularly neat. This is the stuff that you laminate counter tops with, use in a well ventilated area! Follow the directions, you have to let it dry before putting the pieces together for maximum bond. 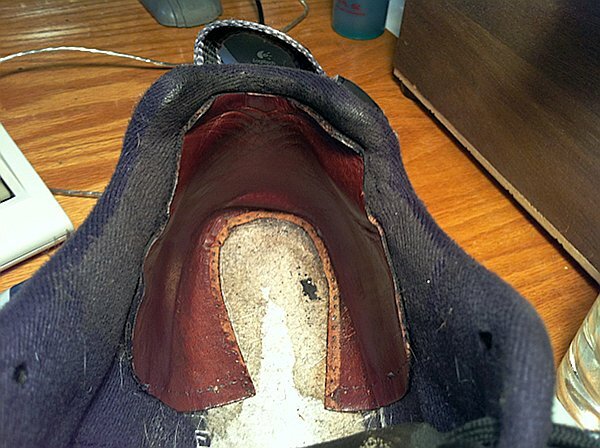 Make sure that the bottom edge of the leather extends under the insole. I made this mod a while ago, now it's been more than a year since and the shoes have been through the wash several times with no special treatment. They are holding up great!